Two Florida Conference missionaries have partnered with a North Carolina agency to help impoverished African pastors and residents get a hand up. 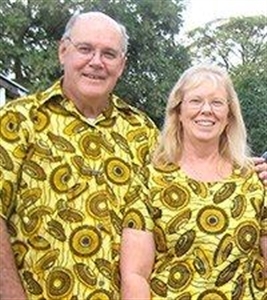 Delbert and Sandy Groves serve New Life Center, a ministry of The United Methodist Church, in Zambia. The Groves’ burden for alleviating the hunger, clothing and school expense needs of local pastors and their families led them to visit a frequent benefactor, the North Carolina Goodwill Foundation in Raleigh, N.C. 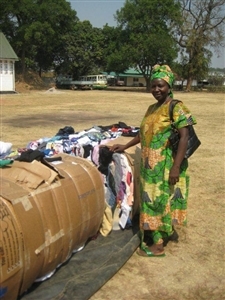 Here, the Groves viewed bales of used clothing as a potential revenue-generating ministry for these same Zambian pastors, widows and others. The couple’s vision entailed encouraging enough Zambian locals to pool their money and cover the cost of the clothing and shipping. A test shipment of two bales arrived in July 2010, and a second arrived this past July. The bales often are broken into manageable sizes for buying and selling on the New Life Center property, and contain a wide variety of clothing. The Groves said local investors—mainly pastors and widows—are earning from $2,000 to $2,700 in profits once the bale items are sold. Delbert Groves said he hopes profits will be re-invested for the next delivery of bales. 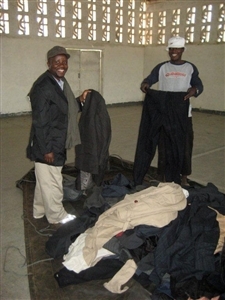 Sales of donated, used clothing sent from the United States provide pastor's and widow's families in Zambia with additional income. A key concern cited by the missionary is the Zambians’ discipline to not exhaust all of the profits. Current participants would like to continue the bale ministry, Groves said, but more funding is needed to expand the program. Additional participants, such as Florida Conference churches, could join with one-time matching gifts of $500. At the same time, Groves cautions that he does not want to create a “dependency” situation between the Zambians and their supporters. “As a missionary, I'm interested in giving someone a hand up (and) not a hand out,” he said. The tendency for Americans to want to “save” Africans is not necessary from Groves’ perspective. Sizing it up: Zambian residents examine the donated, used clothing for sale through New Life Center, a United Methodist ministry. Icel Rodriguez, director of Global Mission for the Florida Conference, is hopeful that Florida Conference churches will embrace the program. New Life Center is searching for warehouse storage area in the Brandon/Tampa area, and also is requesting choir robes and tools. A wish list is available at http://www.newlifezambia.com/NL_Site/Home.html, and the Groves can be reached by email at Groves@NewLifeZambia.com. The Advance Special number for New Life Center is 15057A. Due to the need for a quick turn-around on the clothing bales, donors are asked to send checks payable to Groves Ministry to the Groves’ home church: Pine Castle United Methodist Church, Attention: Shirley Robinson, 5024 St. Germain Ave., Belle Isle, FL 32812-1144.